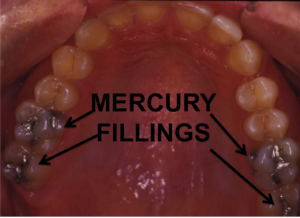 “Mercury in existing dental fillings is no problem.” Can you believe that statement? I heard it from a prominent dental educator. A few weeks ago, I was invited to a social “greet and meet” cocktail hour following a dental seminar I was attending. At the reception, I was introduced to the Director of Restorative Dentistry of a major dental school in the US. He was an educated, tenured professor. We chatted about all kinds of things. Eventually the conversation turned to my emphasis on nutrition and how I treat advanced gum disease in my office. We spoke of toxic substances harming our body and mouth. When the topic came to mercury in existing dental filings, he said, “Amalgams are controversial. Mercury in existing dental fillings is no problem.” He emphasized that there were no studies that showed mercury being released from old amalgams causing damage to human cells. I couldn’t believe what I was hearing. He continued to tell me that dental students at his university were still trained to place mercury amalgams in teeth. The science clearly shows mercury is toxic to the human body, and free mercury vapor is emitted from existing dental amalgams constantly (HERE. HERE.) Just as lead in the water or in paint is potentially toxic, mercury in dental amalgams sitting in teeth is toxic. Just last week, Robert F. Kennedy Jr., Chairman of the World Mercury Project (WMP), announced a $100,000 challenge aimed at putting an end to including mercury, a neurotoxin that is 100 times more poisonous than lead, in vaccines administered in the U.S and globally. As far back as 1998, research was published about toxic mercury in dental fillings. I didn’t know how to reason with this dental educator. He was in a position to know all the science out there. I could only tell him that I have learned so much from PubMed.gov, which is my go-to source for current knowledge. I then walked away. My profession is well trained in the repair of broken and diseased teeth. However, some in my profession are not well informed of the medical research that has been published in peer-reviewed journals. Highly trained and competent technical dentists need to be onboard with current medical research in order to provide patients with the best preventive and reparative treatment possible. Alvin H. Danenberg - or as his patients know him, Dr. Dan - has been a periodontist for over four decades. 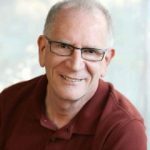 He is also a Certified Functional Medicine Practitioner and Certified Primal Health Coach. Learn more at drdanenberg.com.